The mobile version of the game has a number of different control options, all unique to mobile. These include tap to move using the device touchscreen and an on-screen joystick. Inside the options menu is a dropdown which allows selection of each of the following control schemes. This is the default control setting. Tap-to-move - Tap anywhere on screen and the farmer will walk to where you tapped. Tap on items to action them. 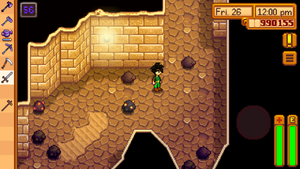 Tapping on stones, wood, stumps, boulders, rocks etc will auto-select the correct tool for the job. Auto-attack - when in The Mines if a weapon is selected (e.g. sword, dagger, club) then it will automatically face and attack any enemies that come within range. You can tap elsewhere to walk away, however you cannot move while the weapon is in mid-swing. Uses tap-to-move for movement control. When a weapon is selected a joystick appears bottom right. Drag the joystick up/down/left/right to face that direction and swing the weapon. Tap anywhere on the left half of the screen, this becomes the center of the joystick. 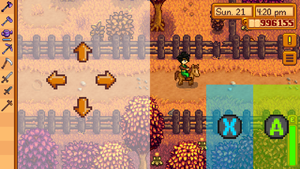 Drag your thumb up/down/left/right to move the farmer in that direction. Button A ( ) - From the bottom right half of the screen to 200 pixels in is the hit area for the 'perform action' button (right click on PC). Button X ( ) - From Button A to 200 pixels in is the hit area for the 'use tool' button (left click on PC). Players can hold this button to repeat using tools/weapons. Button X ( ) - tap anywhere on the right half of the screen and release in under 0.25s to trigger the 'use tool' button (left click on PC). Button A ( ) - tap anywhere on the right half of the screen and release in over 0.25s to trigger the 'perform action' button (right click on PC). Tap-to-move functionality works if you tap anywhere except on the joystick or buttons. Left Button - This is the 'use tool' ( ) button (left click on PC). Players can hold this button to repeat using tools/weapons. Right Button - This is the 'perform action' ( ) button (right click on PC). Same as Tap-to-move + Joystick & Buttons except the buttons only appear when a weapon is selected. Tap-to-move plus a joystick just for moving, no buttons. The toggle button visible with joystick and buttons visible. This checkbox when enabled will add a toggle button to the top left of the screen. When the toggle button is on, the control method is set to whatever method has been selected from the drop down. When the toggle button is off, the controls switch to Tap-to-move & Auto-Attack. Bait and tackle can be attached to a fishing rod by dragging them onto the rod in inventory. Bait and tackle can be switched by dragging a different item onto the fishing rod, but there is no way to remove them. There is no way to direct the cast while fishing; the bobber always lands in a straight line in front of the character.